Welcome to our spun-glass creations page. Please enjoy your visit. 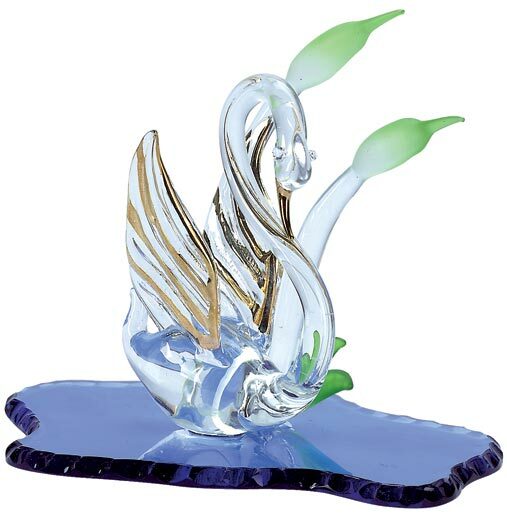 The art of glass making has existed for over 5,000 years, and through the process has been refined, the basic recipe of sand, soda and lime has not change over the centuries. Early glassware was considered a luxury and found only in the tombs of priests and royalty in ancient Egypt. 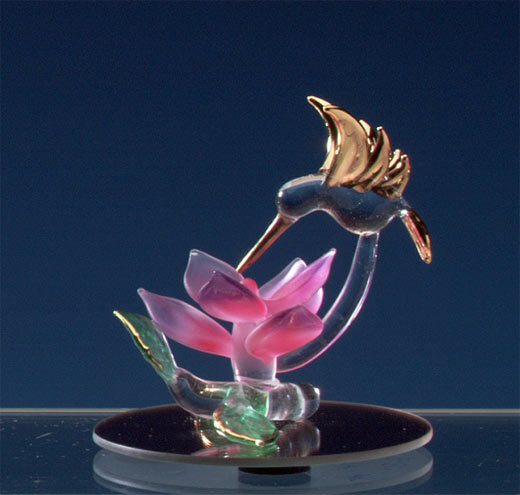 A lucky hummingbird finds herself amidst pink honeysuckle flowers in this inviting glass garden. 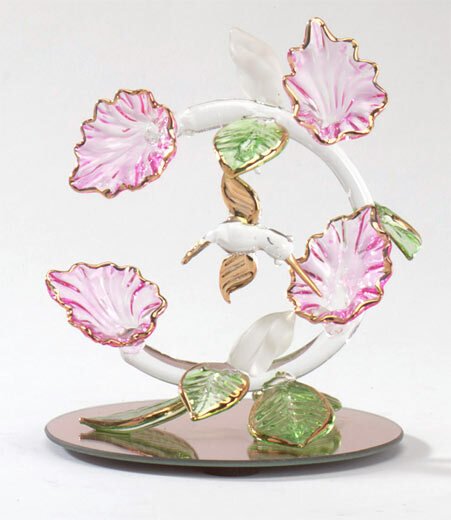 Flowers, leaves and bird are trimmed in gold. 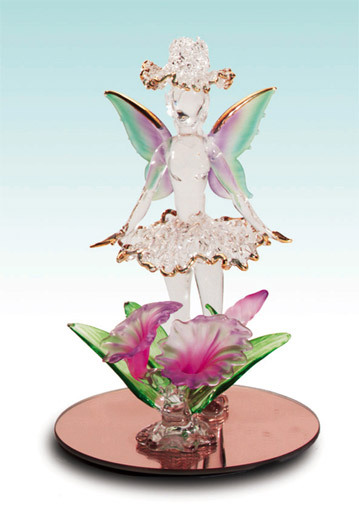 Pink mirror base, 4" diameter. 5" high. 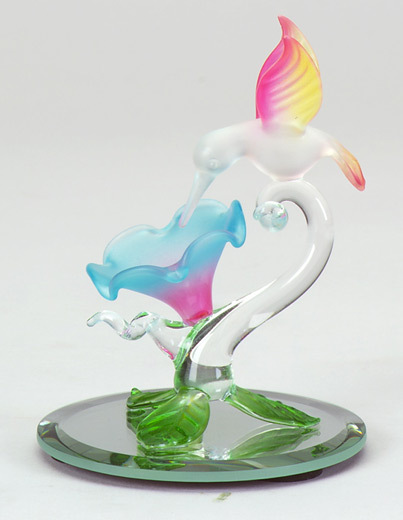 A beautiful rose of frosted glass attracts a hungry hummingbird. Pink mirror base. 2 5/8" x 1 3/4" x 3 1/8" high. 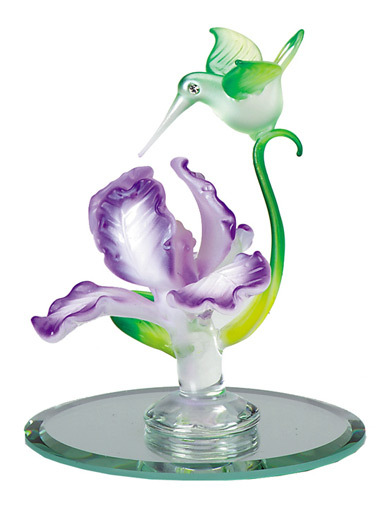 A sip of delicious nectar is the aim of this diminutive glass hummingbird. 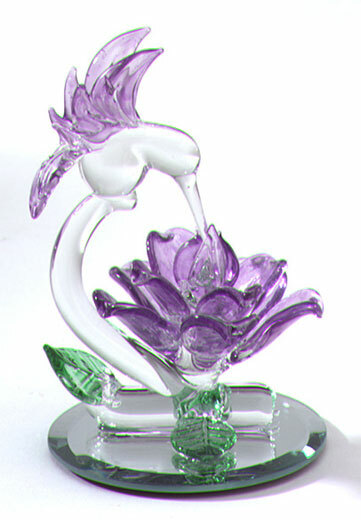 The arrangement sits on a glass and adds elegance and grace to any home. 3 1/2" x 2" x 4" high. 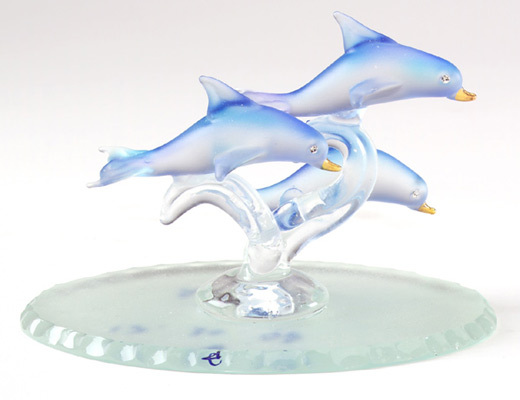 Delicate frosted glass enhances the gracefulness of dolphins as they leap joyously upon shimmering waves, 3 3/4" x 2 1/2" x 3 1/4" high. 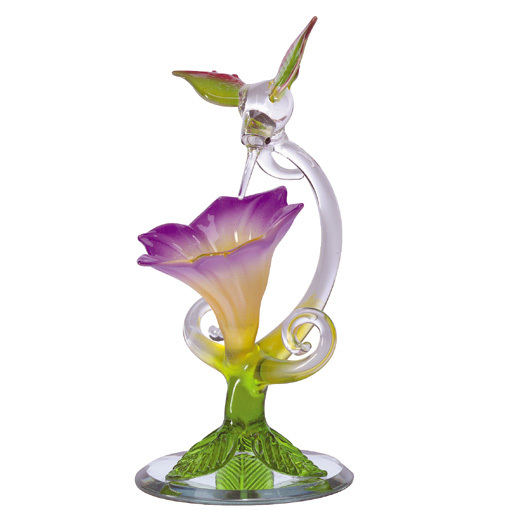 A morning glory is the object of this hummingbird's attention as it sips the delicate nectar. 1 7/8" x 2 1/4" x 3 1/8" high. 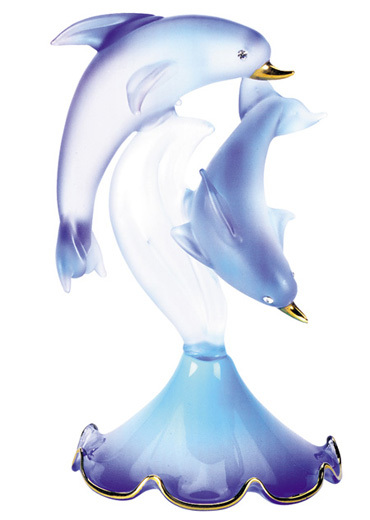 A soft frosted blue tint, gold highlights and crystal eyes enhance these two playful dolphins as they frolic over a morning glory shaped base, 2 1/2" x 2 1/4" x 4 1/4" high. Exclusive. 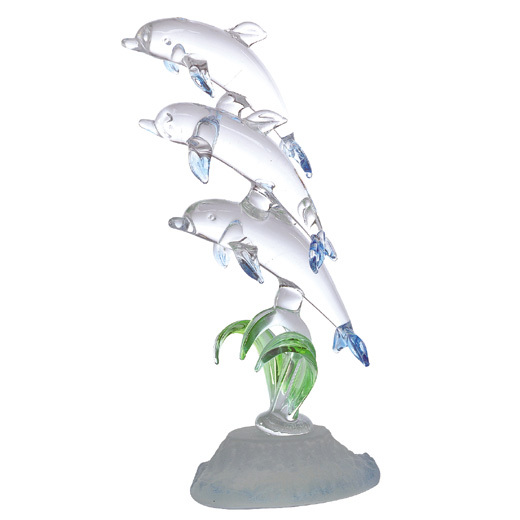 Three dolphins with shaded blue highlights leap over green sea grass set atop a frosted blue base in this lovely glass creation. 2 7/8" x 1 7/8" x 5 3/8" high. Exclusive. 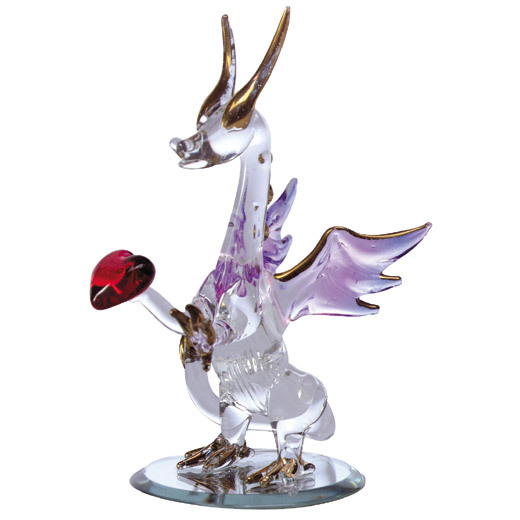 When a dragon offers its heart, it's a sure sign of burnin' love. 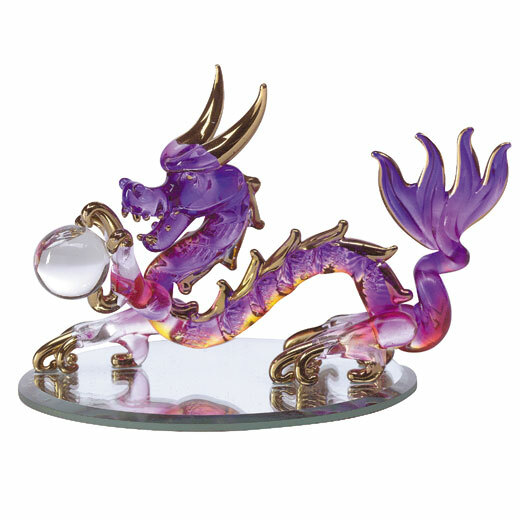 This gold accented fellow is smitten and sits on a round mirror base. 2" x 2 1/4" x 4 1/2" high. Exclusive. 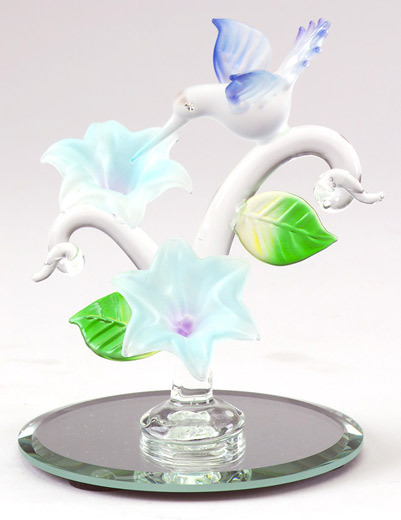 Invistigating a morning glory, this delicate, glass hummingbird with tinted wings will sparkle o your window sill or anywhere in your home. Mirror base. 2 1/8" x 2" x 4 1/8" high. Exclusive.